Clashes broke out between hundreds of protesters and counter-protesters at rallies in Berkley, California, as supporters and opponents of US President Donald Trump squared off at the Martin Luther King Jr. Civic Center Park. At least 200 people gathered at the park where supporters of President Trump were holding a “Patriots Day” rally, US media report.The Patriot’s Day rally was organized by a pro-Trump group, the Liberty Revival Alliance. Among those taking part in the counter-demonstration were black-clad Antifa activists, while on the pro-Trump side were members of the Oath Keepers militia from Montana, as well as a group of bikers. At around 10am, they were met by an equally-sized group of counter-demonstrators. At two different points, a loud bang could be heard followed by an outbreak of fist fights. Riot police moved quickly to separate the two groups. 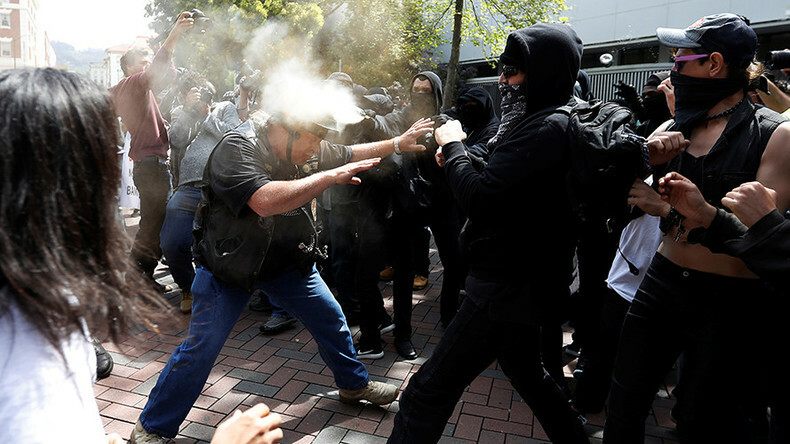 Eleven people were injured, Berkeley police said, adding that one person was stabbed amid the clashes. Police also arrested at least 21 people. — Spencer Blake (@spencerjblake) 15 апреля 2017 г. Tear gas and pepper spray was used in the ruckus, as well as fireworks reportedly being thrown. Several people have been injured, Berkeley Police spokesman Byron White told CNN. At least one man was seen with a bloody face after coming face-to-face with Antifa activists. Several officers were also reportedly assaulted and Berkeley police had to call for backup after being pelted with stones and bottles. Police had erected a light plastic barricade to separate the two groups, and went around collecting sticks, flag poles, and anything else that could be used as a weapon. This would not been the first time fighting has broken out between pro- and anti-Trump activists on the streets of Berkley. In February, rioting broke out at the UC Berkeley campus before a scheduled appearance by then-Breibart News editor Milo Yiannopoulos, which had to be cancelled after protesters threw rocks, broke windows and set fires outside the student union building.